Nokalak's one piece Drum Dancer with black oversized drum is an exceptionally beautiful piece. 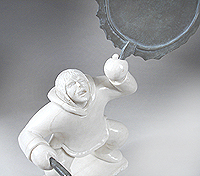 Carved out of hard, bright white dolomite and finished with a high polish, Nokalak's drummer would be a valuable addition to any serious Inuit art collection. It is one of the best examples of the high quality art being produced by the carvers of Canada's Central region.